Counting CRU "tricks" | Watts Up With That? Steve McIntyre has blogged an excellent must read technical explanation about IPCC and the “Trick” on the newly provisioned climateaudit.org now on WordPress.com. He provides the context that CRU says the emails lack. So, I thought this would be a good time to have a look at the word “trick” and how it was used in the leaked CRU emails. The word ‘trick’ was used here colloquially as in a clever thing to do. It is ludicrous to suggest that it refers to anything untoward. Well that certainly seems reasonable on the surface. For example, an American colloquialism is “that’ll do the trick”, when a solution to a problem is found. I hadn’t thought much more about it until I was reminded of this again this past week, when Dr. Michael Mann, in an interview with the State College, PA newspaper Centre Daily, defending himself and Dr. Jones about the language used in the emails. Mann said Jones was using the word “trick” in the sense of “here’s the trick for solving that problem,” not to indicate anything inappropriate. So if Dr. Jones uses such colloquialisms regularly, it stands to reason that we should find a number of similar instances of the word “trick” in the CRU emails over the decade that the emails spanned. I decided to find out. I was rather surprised that so few files met the condition, so I ran it again to be sure, same result. I took off the quotes to see just how many emails contained some permutation of the letters t r i c k.
The CRU emails can be found at http://eastangliaemails.com/ if you care to look at the originals. So as you can see, we really have only one instance where Dr. Jones uses the word “trick” in reference to a procedure on data. There are other uses and variations of the word “trick” in other emails, but only this one instance attributed to Jones where he refers to this data issue. As Dr. Jones put it: The word ‘trick’ was used here colloquially as in a clever thing to do. Perhaps, but you’d think we’d see it in general use by Dr. Jones in other emails if it was indeed a colloquialism. In the thousand plus emails we have, there’s no other use of the word “trick” by Dr. Jones that I could find related to data truncation or otherwise, though there are other colloquial uses of the word by other authors. Which shows that CRU did indeed truncate tree ring data, so that the decline is not shown in the IPCC report as shown in the red line above. They refused, stating that this would be “inappropriate”, though a short discussion on the divergence was added – a discussion that was itself never presented to external peer reviewers. December 10, 2009 in Climategate. I have been looking at the Environment Canada weather site where they provide an almanac for any of hundreds of cities. A random pick of any city will generally show that the highest record temprature for any given day at the chosen city is 3 or 4 decades ago. Lowest recorded temps are almost always more recent, in the last 20 years typically. If the atmosphere is warming then how is it that the records seem to be timed so out of phase? On another note, I am always impressed by the outrageous lies passing Al Gores lips. The officially reported environmental conditions seem also to be out of phase. Unfortunately he has a big megaphone. I really hope that U Penn takes its role seriously in looking at Mann. All in all, something of a crank, with a spotty record. If, at the end of the day, he’s shown statistically to be correct, then he’ll be a hero…but I think we’re far from showing that. Actually, I think trick was used to refer to the ‘quick and dirty’ way to ‘transform data’. Lots of colloquialisms about. Speaking of tricks, what is happening to the JAXA sea ice graphing these days? DId they change the algorithm again. Ice area significantly dropped for a couple of days, went sideways before starting to climb again. Is it wind and temperature or is it just algorithm issues again. NSIDC didn’t show it for a few days but today they went back and adjusted their graph to be flat for the last few days. Odd to see all these back dated adjustments all the time. Does anyone know why they go back and adjust these graphs everyone once in a while. Wish I was keeping screen shots but it is baffling why they have to keep adjusting them. Yep…. Seems a classic and well presented case of Liar, Liar, pants on fire, to me. The evidence is robust. The conclusion, damning. They can run, but they cannot hide. Some people still cannot understand just how easy it is to check what others say and display it. So much for the “taken out of context” plea. You’ve put the use of the word “trick” in a very damning context. represent an even more serious indictment of the “science” of climate change. And while readers of Anthony’s & Steve’s blogs are long familiar with the problems these two posts discuss, a question that remains is — where have all the environmental “journalists” been all this time? I did notice that the other day. It looks like a reverse of the adjustment they apply in June, but it could be anything as far as I know. Maybe they did a physical inventory and had to book an adjustment? I think it’s also a question of supply and demand, more specifically, pent up demand for those who refute the claims of the AGW crowd. The demand pent up courtesy of the scientific journals and peers for ten years, silenced those who would offer a well reasoned scientific analysis. Now the flood gates of ten years of pent up demand for that analysis have been opened, consumers need their fix, and they are finally going to get it. The real story was the divergence from proxies to real measure. It then became a mere “trick”. Think if this error were allowed to stand for something as simple as house paint, the placement of a stairwell, your surgeon’s approach. And we are to believe these clowns? Hmmmm. Sea ice. Noticed the same thing. What happened to the ice around the pacific side of Baffin Island? And what is the deal with those voids where they are extremely unlikely? Speaking of tricks, what is happening to the JAXA sea ice graphing these days? DId they change the algorithm again. Ice area significantly dropped for a couple of days, went sideways before starting to climb again. Is it wind and temperature or is it just algorithm issues again. There was quite a strong kink in the jet stream for a few days. During that time the sea ice in the Bering Sea was significantly compressed back in towards the Bering Strait, which was probably the major source of the “loss” of sea ice; it just reduced the extent, probably no melting or other adjustments took place. The usage of the term “trick” in the context of this email couldn’t be more clear. The “trick” was a way to quickly transform the raw data into something that would fit their goal. Luckily for us, Phil Jones then stated what his goal was in using the “trick.” He wanted to “hide” the tree ring data that showed a “decline” in temperatures after 1960. The only question is why? Is there some legitimate reason why the tree ring data was trustworthy before 1960 and untrustworthy after? No obvious explanation comes to mind. And since Phil Jones chose to avoid the real question and discuss the semantics of the word “trick,” I have my doubts that there is a legitimate reason. Why, if they are so confident of their case, do they need to “hide the decline”? I suggest that is evidence of intent to defraud. I hope you understand I was pointing out the use of trick in another email above in reference to the use of data. It is the one with the subject line ‘updated figures’. It isn’t Dr. Phil saying it, but I would like to know what ‘rejection rate’ refers to. Looks like something referring to a model, but what is it exactly? Anyone know? “I really hope that U Penn takes its role seriously in looking at Mann”: does it have one? Isn’t he at Penn State? With the greatest of respect Anthony, isn’t the use of ‘trick’ in the penultimate e-mail here also an example of the ‘clever thing to do’ useage? Instinctively, I feel that the ‘trick’ to ‘hide the decline’ e-mail is enough to call the CRU operation into question but the really damning e-mail seems to be Trenberth’s ‘travesty’ outburst. Here is an admission from a ‘scientist’ who is pulling his hair out over the fact that the models do not work: he even forgets the party line to invoke local ‘weather’ conditions to make his point! If the models don’t work, the output is unreliable: time for them to consider some of those papers they suppressed. 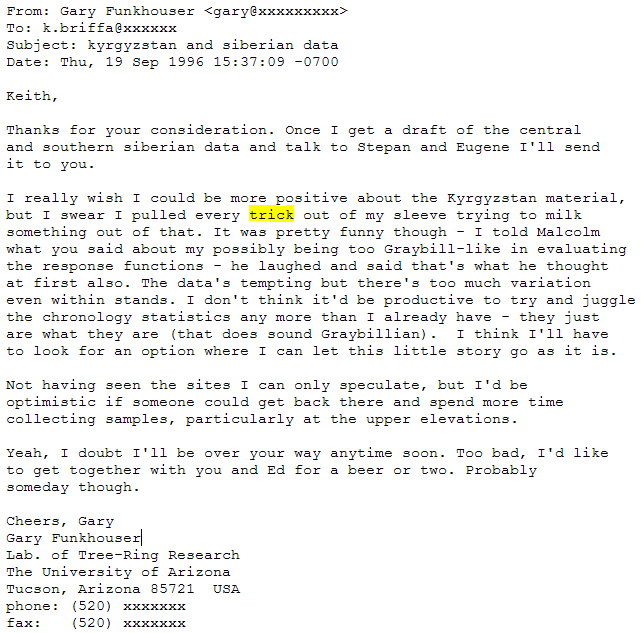 Was the 2005 sunspot paper mentioned in Jasper Kirkby’s lecture one of them? Maybe this is already clear, but the context of “trick” is two-fold. It’s Mike’s Nature trick and it’s part of the “hide the decline” methodology. The latter is clearly damning. But what about the “Mike” part of it? What did Mike do to the data for Nature? Something un-Natural? Or something clever? Here’s a good one. An AGW proponent told me that they stop using the tree-ring data after a certain date because trees stop producing reliable data above a certain global average temp. Of course, there is no science in this hypothesis. If the trick was used make something more easily understood its use would be understandable. However Jones’s trick was used to hide something (the decline) and is clearly fraudulent. Nature is doing it’s own trick, mainly the 70’s look to winter. And the sun has a tricky small speck in the midst of dissispating Active Regions from last rotation’s run of small spots. Add two more to the list (at least two). There’s another “trick” now being used to hide declines – this time with ground station temperature records, THE RAW DATA OF WHICH APPEARS NO LONGER TO BE AVAILABLE. The front page of http://surfacestations.org shows two PERFECT examples of the states (and trends) of two surface stations – one in Orland, CA (good setup, there for over 100 years), and the other in Marysville, CA (near asphalt, AC exhausts, a shelter and a cell tower). The photos and the station plots in the thumbnails speak for themselves, plainly and clearly, with links to the NASA GISS data from whence the plots came. Not any more. NASA seems to have responded. The raw data is no longer available. You’ll be shocked at what you see now. REPLY: yes the data has been changed, no doubt about the truncation. I’ve seen your blink comparator about Orland, but something is not right. The “after” portion of the data you display doesn’t match the current data image at Orland. 1) Possible mistake in the “after” Orland image? 2) When did you download the “after” image for Orland? UPDATE: I have determined that you made a mistake in the original blink comparator image, and I have removed it because of that error. The “after” station data was not from Orland, but from another station. I’m making a new blink comparator to show this change correctly. See also my inline reply in your comments above. I have determined that you made a mistake in the original blink comparator image, and I have removed it because of that error. The “after” station data was not from Orland, but from another station. I’m making a new blink comparator to show this change correctly. Beat you to it, but I got 11 in 10 posts because I allowed “trickier” The only occassion where it appears to have been used in the so called colloquial sense was by, I thnk, Ben Santer, who put inverted commas around it. Great analysis, send it to whoever does the investigation. They do not talk about having superior data to win the day. They talk about their established “ procedure to drive them crazy”. Huh? I don’t ever remember that as part of the Scientific Method? IN the best of lights it sounds like orchestrated obfuscation. The (dutch) minister is bananas? I herad they changed the percentage of ice required for it to count in the extent figures. The problem isnt the word “trick”, the problem is in the phrase “hide the decline”. Why a scientist has to vanish a decline in the graph of his data? 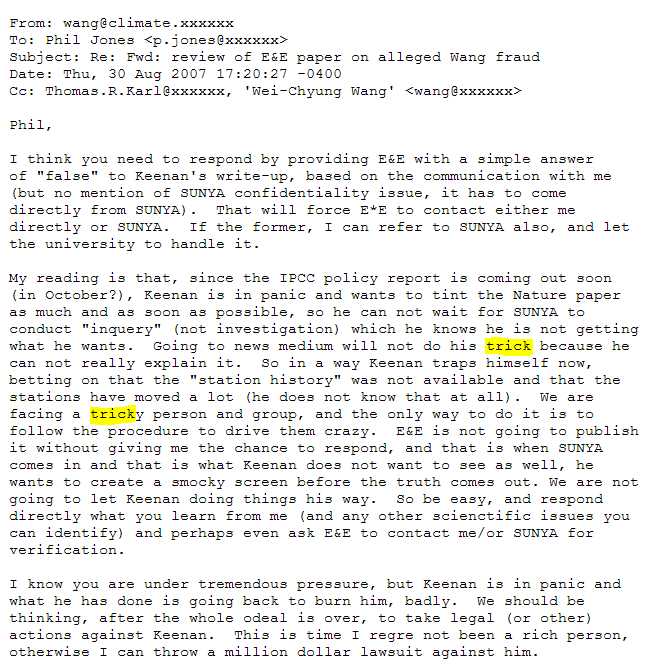 I notice from the email from Wang to Jones on the 30th of August 2007 that the Team is so entranced by the hockey stick that they also talk of a “smocky screen” rather than a smoke screen. The hockeystick is dead. CRU is dead. The sun is dead. Ocean currents are in the cooling phase, starglitters are such that is should be cooling….and yet the november global temperature was one of the highest november temps ever recorded. Isn’t it time to admit that the earth is indeed warming up ? And if every possible parameter is in the cooling mood….wouldn’t it not time to think that maybe, maybe mankind has some influence on that warming ? If not, then it is certainly time to act durable with fossile energy. No matter how much there is still in stock, the less we consume the longer we have fun of it. And notice that case is the only one where trick is inside quotes. He is using quotes to denote the colloquialism of a technique, the unquoted versions are when he means a traditional meaning. The word “trick”, or its plural “tricks” showed up 11 times in 10 e-mails. Or at least “ENSO” neutral. That would not be good for California’s drought, which will return with a vengence. Warm Pacific currents have melted quite a bit of recent ice off Alaska. I wonder if any of that El Nino warm water reaches the Bering Strait. Hudson Bay is freezing over now which is causing a jump in total ice cover. If they’re using proxies to hide the decline in the 20th century then they need to use them to show the increase in the MWP, as the divergence would have happened then. They must have worked out a divergence ration by now. Al Gore says millions of evergreens are dying in the American West, as it warms so taking his hypothesis, trees decline during warming periods – yet the hockey team say that trees grow larger with elevated warming and this signal doesn’t show post 1960 and during the MWP. The consensus is a methodological muddle. There is also “trickery” to look for. In one email they apply this to an opponent. When accusing others, folks will often accuse the “other” of doing what those folks do themselves. This is just a normal human behaviour. You know someone is doing it, because you are, so to think the “other” is not doing it seems unlikely… In this email, right after “trickery”, we see what they do via what they accuse in others. (vis the GHCN data deletion / omission). We also get a nice “roster” of who is on the inside committee via the cc: list. Oh, and notice that his definition of “standard practices of peer review” is that one of their team gets to be a review… Cheeky. methodology:  it can be quite sensitive to the input data in the early centuries. Whatever any AGW alarmist might say about possible interpretations of “trick”, there is only one way to interpret “hide”. And “hide” is just what they should be doing now, preceded by a significant period of “running”. If that list is a comprehensive set of examples of Dr Jones’ language usage, it seems that he uses the word ‘trick’ primarily to describe a course of action which may be considered underhand, but will address a pressing issue. Perhaps ‘underhand’ is too strong a word – the actions he describes as ‘tricks’ generally seem to be political manoeveurs, taken in response to what he sees as political manoeveuring on the part of his adversaries. The manoeveurs all have the characteristic requirement for secrecy – what this looks most like is a set of e-mails between politicians and their advisers, trying to counter opponent’s political machinations. The point that comes out of this exchange is that the scientists are not behaving ‘scientifically’ – they are behaving like political flagbearers for a cause. I suppose that no one who has read C P Snow should be surprised at this, but it does point to one major issue which has not been given much prominence: that of balance. Generally, sceptics have been disturbed by what we see as bad science – incorrect use of statistics, data modification and the like. In theory, the warmists could address these concerns, and still claim that there was a case to answer, because it is still posible that the world has been generally warming between 1970 and 2000. However, a major plank of their argument is that this warming has occurred, and there is no other explanation apart from CO2 increase. We might accept this statement if we believed that the warmists had dispassionately looked for other explanations, but this political attitude indicates strongly that they are interested in pushing their hobby-horse, and completely uninterested in finding any other explanation which may apply. The use of the word “trick” is quite common in English language, both here in the UK & with you Colonial chaps & chapesses:- Neat trick, nice trick, clever trick, good trick, handy trick, useful trick, favourite trick, cool trick, etc. “Strategem, piece of guile, way or knack of doing something, habit of doing something, a personal peculiarity of behaviour, piece of unexpected treatment, practical joke (getting closer), out-of-the-way feat eg juggling or dog begging, trick(s) of the trade, petty prevalent dishonesties (even closer), to know a trick or two, to play one/silly/mean/scurvey, to accomplish one’s purpose (gotcha, hook line & sinker), the winning hand in cards. Also, “trickery”, meaning to ” cheat or beguile, belie (too close?) the expectations of, adorn showily, deceitful conduct (woooh! Now that is too much, surely)”. I didn’t define this word, my highly educated & honourable peers of yesteryear did, has it really changed so much over time? BTW I enjoyed the post on the Greenland (meaning “bounteous land ideal for farming & animal husbandry & growing crops & grapes to make wine-land”, as it was known when first settled, or “F%*k-it’s-freezing-land” as the literal Viking translation would have it when they left it) ice-cores hockey stick. If I had the IT skills I would love to prepare a series of slides for power point to show these extended graphs, initially with no temp or time scale, but to fade them in gradually to emphasize the reallities. Looks like fur hat, coat, & themal underwear time to me! BBC & Channel 4 doing their darndest to sweep truth, or at least serious questions, under the carpet. C4 News had a Q & A session with UK Climate Propaganda Minister Ed (I know more than you) Millitant yesterday evening. I fess up I didn’t see it all as the local church Christmas Carol Service rehearsals demanded my attendance. It appeared to comprise people who were greenies in business, pro-eco windmills, & a poor woman whose shop was flooded (absolute conclusive proof of CC although she did have a slight question mark in her statement) in the recent downpour in Cumbria. No sceptics or scientists such as Piers Corbyn/Stephen Wilde/Richard Courtney were present it seemed, but I am happy to be corrected. The “move along nothing to see here” re the emails (still stolen not leaked) weren’t mentioned. If somebody had said to me 30 years ago, that by 2009, in the UK every aspect of society will be controlled by government intervention, every institution will be controlled, including the media & of course the state run public broadcasting institution the BBC, infested & infected by green eco-stalinists, banning every form of dissent from the political mantra & diktat, I would have laughed in their face & called them mad. I wonder who is laughing now? Apologies for length snip as desired. oceans giving off heat mean they are cooling -as oceans heat the atmosphere. There’s a delay between heat loss and temperature change. Typically before prolonged cooling, there’s a series of temperature peaks. Incidentally, i’m not convinced the last 10 years were the warmest on record, if the data has been dowgraded from the past and upgraded in the recent period. In a warming world human factors have less influence (if you mean co2) but in a cooling world co2 has more influence, since its more likely to overlap the absorbtion bandwidths. Thats the nature of the regulator. But even that is giving too much importance to co2, as other water vapour has 3 times the bandwidth and overlaps many radiation frequencies. so no, the human influence doesn’t come into it. If the “airborne fraction of c02 remains constant” that means that it remains no more than 3% of the total co2 content. It is impossible to claim that 370ppm does nothing, but 18ppm has all the warming influence. Isn’t it time to admit that the earth is indeed warming up ? If not, then it is certainly time to act durable with fossile energy. No matter how much there is still in stock, the less we consume the longer we have fun of it. Firstly, even on this site most people accept that the world has been gradually warming over the last century. It’s what is causing it that is in dispute. But you don’t want to believe that, so you won’t. But that doesn’t make it untrue. The world is warming. Slowly. Big deal. Secondly, no-one anywhere is doing anything about consumption of fossil fuels. There are loads of “solutions” about CO2 emissions, but that is hardly the same thing. The argument that Copenhagen is a good thing, even if AGW is false doesn’t last a minute of sustained analysis. Yes, we should reduce fossil fuel use. Yes, we should reduce pollution. I might even be persuaded to spread some wealth from first to third world. But Copenhagen is a crackpot way of achieving that. In any case, if you want to green the world then you should argue that on its merits. Not smuggle it in via some scare story. To me there are three key questions here. 1. Does this TRICK distort the interpretation of data i.e. what would the opinions of expert reviewers be on the claims made using the ‘transformed’ data vs the ‘real’ data? 2. Now we have the capability for global wide monitoring of temperature using satellites, should we not just simply put this proxy research to bed, given the levels of controversy involved and the need to manipulate the raw data to get ‘meaningful’ results? Or is the historical analysis of proxies still key to resolving the debate?? 3. If you knock out all the tree ring proxy data from the evidence base, what does this do to the warmist AGW argument? Is it key, useful additional stuff or a minor addendum? Question three is the one all skeptics must face honestly. If it is a minor addendum, then there is a legitimate argument that skeptics are attacking a tiny point of weakness for their own purposes. IF it is the only point of weakness. If, on the other hand, this is but one calumny amongst many, including weather site inconsistency, arbitrary weather site data ‘adjustment’, rebalancing weather site datasets in favour of those with UHI fingerprints, computer models designed to predict warming, lack of evidence to confirm amplification of seeohtwo greenhouse effect by other greenhouses gases, lack of factoring in of cloud effects into modelling, long-term denial of solar and oceanic effects on climate until recent admissions etc etc etc, then the argument is an important part, but only a part, in demolishing the false case of the warmers. Land of Oz threatened by giant iceberg. Got a reply for my complaint lodged against CRU and emails from Defra..finaly. On 3 October 2008 the Prime Minister announced the creation of a new Department of Energy and Climate Change (DECC). The new department brings together much of Defra’s previous climate change responsibilities with the energy component from what was at the time the Department for Business Enterprise & Regulatory Reform, to focus on solving the challenges of climate change and energy supply. Defra is currently responding to letters on these issues on behalf of DECC. Thank you for your e-mail dated 24 November to Hilary Benn about the recent UEA e-mails incident. I have been asked to reply. We do not find credible any suggestions that emails stolen from the University of East Anglia show that scientists set out to deceive the world about temperature rises, and thus that climate change is overstated. We welcome the University of East Anglia’s Independent Review on this specific incident, which was announced by the University on 3 December 2009 and will report next spring. However, we remain confident in the robustness of CRU temperature analyses, which is closely corroborated by two entirely independent data analyses of the instrumental record. The increase in Earth’s surface temperature is not disputed by any recognised climate experts. Its effects are also visible in declining Arctic sea ice, retreating glaciers, and rising sea levels, among other impacts. The UEA temperature analyses have been peer reviewed in many scientific papers over the last twenty years. They have also been assessed by the IPCC in its last three reports. This month the Intergovernmental Panel on Climate Change (IPCC) has issued a statement which supports this in detail. A firm, broad foundation of scientific evidence indicates that the impacts of climate change will be more severe if we allow warming to continue unchecked. Also, economic analysis shows us that investing in a low-carbon society now will protect us from incurring much greater costs from the impacts of climate change in future. By keeping warming to 2°C, we have the best opportunity to avoid the most severe impacts of climate change. But doing so requires us to take action now. Failing to take action, in full knowledge of the risks invoked for our future health, well-being and economic success would be wholly irresponsible. Isn’t it time that Griss, NASA, and CRU become totally transparent? The Same cherry picking of data can be observed in the Road safety Industry in the UK and probably the rest of the world. The focus on ‘Speed’ and the money speeding fines generate, blinds them to all other causes and possible solutions. No debate,massaged figures and well payed jobs for the believers. What we have suspected and been confirmed by you honest scientists, shows that the Global warming industry is just as corrupt. Interesting. “We do not find credible any suggestions that emails stolen from the University of East Anglia show that scientists set out to deceive the world about temperature rises…” Did they even read the emails?? Julien could at least have played the game better, and left it at: “We welcome the University of East Anglia’s Independent Review on this specific incident, which was announced by the University on 3 December 2009 and will report next spring.” But no, he had to go on and explain his personal view of reality, which is apparently far more ‘robust’ than any senior climatologist’s. And of course, the emails were ‘stolen’, not ‘copied’, nor posted publicly by someone inside with authorization. Case closed on that, too. The fact that it’s Julien’s baseless opinion apparently does not matter in the least. The fix is in; the decision has already been made. That much is clear. I saw that too – he is a numpty who infamously got sloshed at the Orwell Prize Awards [he was on the panel] and did an uber rant from the stage. It was very funny – ever since Climategate broke, Andrew Neil [host of DP] has been right on the money [he pwned Watson over UHI before anyone else was even talking about the emails nevermind the data]. He mentioned having very good contacts with serious climate science players who think the books have been cooked/sceptics forced out. I wouldn’t be at all surprised if he was a lurker here. It seems to me that the warmest decade is the 60’s, not the past 10! At least for this station it is. Now you’ve done it. You’ve got me looking at the emails… I was trying so hard not to (other folks were doing it, and I had some tech things I wanted to get done. But NoooOh. I’m looking at the emails and finding interesting answers to things. 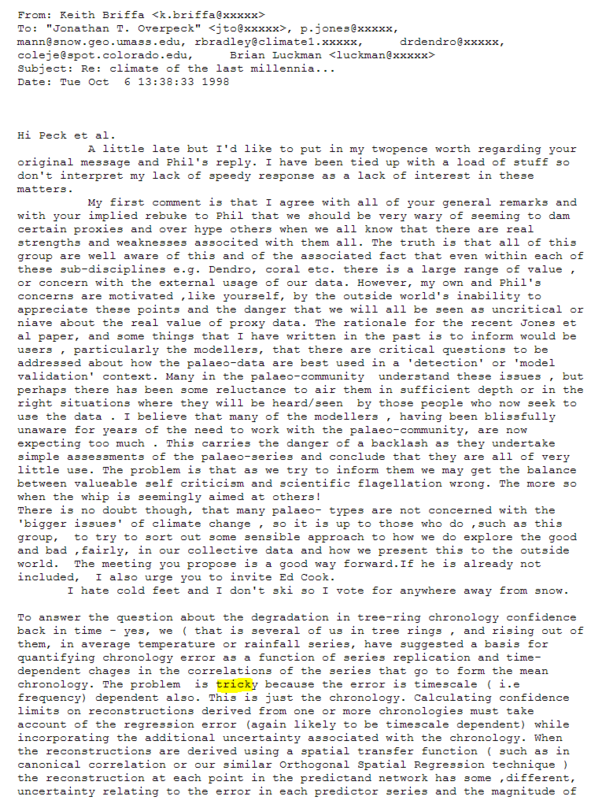 From 1248902393.txt where there is a letter from Phil Jones to Thomas Peterson quoting an earlier letter from Peterson to Phil. I was going to make this a long comment, but decided to stick it in a posting instead and save the moderators a bit. It basically has some interesting connections between NCDC and CRUt and between both of them and the IPCC (showing there is no independence there). There is also a discussion of what data to not release (including the fact that in 2003 they had some data on their web server, but not all). And a discussion of who ought to do what for the IPCC and who ought to nominate whom. And there is the rather interesting point that they were assembling a FOIA file on their web server (a different file) but it shows that the web server (that already leaked some temperature data) is where the leaked FOIA file would have been. And that it has had security failures in the past. And that is the same server that was shut down by UEA after the leak. I think this strongly points to a permissions failure (i.e. they published the data) rather than a hack. I’ve tried desperately not to get sucked into the email files… Oh well, it’s such a treasure trove. Yes, they are acting politically and with a cause in mind, not caring whether their conclusions are valid or not. In effect, trick means using anything they can come up with to thwart the scientific process. They have both a method of operation and motive. That is enough to investigate for possible indictment. A lot of money is involved. And to this very day, they are still at it defending the data as if the conclusions are pre-ordained, refusing to open up to scientific criticism and counter opinion, delving into the same monopolized paper finding stunts repackaged with a paint job. I see no sign of serious debate, and there never was one. The media, which is to say, the few sources reporting this story, have seized upon the “trick” as the proof that the comments are out of context. As a programmer primarily concerned with isolating demographic data in multiple sets with diverse structures I have built up quite bag of program short cuts, call them “tricks”, that plow through the dross without compromising the output. Call it a “trick”, I personally think of it as hard won experience. However, how precisely would one find a different context in the phrase “hide the decline”? Mr Watts, this is appaling. I read this blog regularly; it’s usually of quality and suddenly you’re reduced to counting instances of a word? (1) The fact that “trick” isn’t used in this context more than once means nothing. English is a rich, complex language. I have been in academia for a few years; I can easily imagine using a particular word like “trick” in the context of a “clever thing to do” just once in several years of emailing. (2) If you’re going to use this argument, then surely of relevance is the fact that linguistically speaking, you haven’t found any more potential references to deceit anywhere in the data. All there is is “trick” and “hide the decline”. By your argument, if there was intention to deceive, there would be lots of uses of the word “trick”, “cover up”, “hide”, “distort” etc. I’m far from an AGW believer. Do you know how much fuel something like this is going to give to those that are? Well, so far all the AGW proponents seem in defence mode than discussion mode. Its interesting as when scandals are revealed about politicians fiddling expenses, they go into defence mode then regret mode. The latter because they are accountable to the public. None of this takes place in climate science, ie. it isn’t accountable, so they can rally, panic, fudge, express disapprobation until they are blue in the face, and carry out a PR exercise to try and convince us even more that we’re doomed. Science isn’t a PR exercise ultimately though – but witness Copenhagen. nothing but seduction. Science isn’t seduction either. This really shows how erratic and corrupted the scientific process has been rendered by political interference. OT, but as an Advanced Motorist for 21 years, I can advise that the Department of Transport’s own figures show quite clearly that speed is only relavent in 12% of accidents. Inattention at the wheel (25%) & lack of forward observation being greater! I dare say they will be adjusted by the PC brigade to show otherwise!!!!!!!!!! (The firgures didn’t show what they expected them to show to reinforce the case for ever more speed cameras). c.1412, “a cheat, a mean ruse,” from Old Norman French trique “trick, deceit, treachery, cheating,” from trikier “to deceive, to cheat,” variant of Old French trichier, probably from Vulgar Latin *triccare, from Latin tricari “be evasive, shuffle,” from tricæ “trifles, nonsense, a tangle of difficulties,” of unknown origin. So, what Phil Jones did was actually nonsense, if one goes by the original meaning of the word trick. 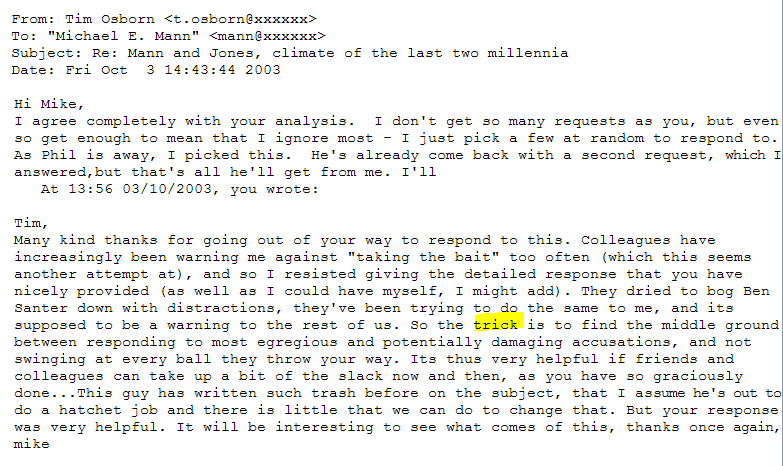 Ignoring McIntyre’s definitive elaboration, ‘trick’ is obligate slang, always used colloquially, but the meaning suggested by Jones for his use in the second email above seems strained and would be most pedestrian vernacular in the event. Jones’ occupation is turning tricks for the IPCC. Re nick cohen on bbc politics show last night and I quote. ‘Um err um’. I thought andrew neil nailed him and portillo mentioned that the cru is ‘ a major part of a very slim pillar of evidence’. Cohen did concede that cru had behaved badly. IMO the three ‘and there is only 3) props of the whole agw argument are discredited. Darwin. Shows that GHCN numbers are suspect,we know cru are more than suspect and (according to jones) GISS is inferior to cru. Forgive me if this video of the marvellous Monckton naming and shaming for the climategate affair at Copenhagen has already been posted, but I just watched it, loved it and had to share. I don’t think it’s too far OT because it’s about more tricks… and who was involved in that and why. The disproof of Jones’ and Mann’s assertion is in the original email. The purpose of “the trick” was to “hide the decline.” In other words, the trick was used to make something that the data said existed, disappear. This is part of the classic magician’s repertoire, not a responsible adjustment made by a scientist with a responsibility to the public interest for truthful accounting of data. Houdini could make an Elephant disappear. The CRU team apparently made it a regular habit to perform lesser miracles. The only trouble is, that’s not what they were paid for. Their own language betrays them. Read the whole email. The meaning is pretty clear; they were trying to figure out a way to deceive the public. Here’s looking at various words starting with trick (in addition to excluding Patrick, there’s also a “few” references to McKitrick…). Tricky is popular, here are the lines referring to it. I’m sure this is going to format horribly, perhaps if I bold the filenames it will be tolerable. 1031923640.txt:have here. There are some tricky issues that need to be addressed. 1121869083.txt: composite is tricky – and no obviously “correct” way is apparent. 1153233036.txt:>scale as observed temperature rather tricky! 1209080077.txt:Estimating the order of a more complex AR model is a tricky business. 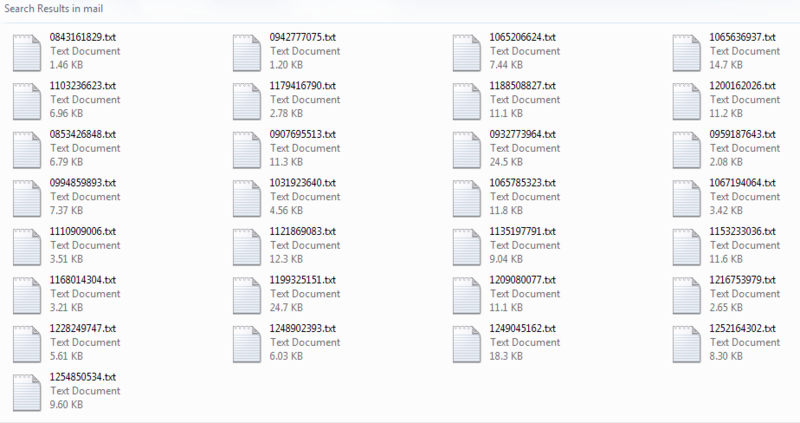 1249045162.txt: > > Data that we can’t release is a tricky thing here at NCDC. 1249045162.txt: > Data that we can’t release is a tricky thing here at NCDC. 2) to point out the claim is nonsense since the same basic result has been obtained by numerous other researchers, using different data, elementary compositing techniques, etc. Who knows what sleight of hand the authors of this thing have pulled. Of course, the usual suspects are going to try to peddle this crap. The important thing is to deny that this has any intellectual credibility whatsoever and, if contacted by any media, to dismiss this for the stunt that it is.. Think about the “hide the decline” plot from McIntyre above & if the historical temp record was hung off the red line – there would be absolutely nothing spectacular about present day temperatures at all – they would be similar to what they were in the 1400’s. I was fascinated to read the email of 17th May 2007 regarding the ‘New Scientist’ as that was the month I cancelled my subscription because I realised it had fallen into the trap of ‘consensus science’ and therefore had become more or less useless to me. Leaving out the Briffa data is lying by omission – plain and simple. That would earn a “failure” grade on any college lab report. Does anyone have an idea of what he may be referring too? it doesn’t sound any better now, does it? As a seasoned and scarred political fighter, (albeit with little scientific background) I have to caution everyone here that having the truth revealed and the facts on your side won’t be enough to stop the move to C02 regulation. I’ve lost that battle before. The truth will just be brushed aside and -to a liar- the facts are whatever anyone says they are. There’s just too much money in it – for industry and for government. Industry will pass its costs on to the consumers, and government has found a new source of tax income A new thing to tax is hard to find after 2,000 years of government taxation experience. They won’t let it go easily. The hardest battle to redeem objective scientific method lies ahead, not behind. This is unbelievable. I am in awe as to the depth of this chicanery. All of us owe you guys a great debt. 2. An accusation of deception directed against an opponent or opponents. Is it now clear why the IPCC cannot investigate this? They probably instigated the whole mess. Oh, I see–should’t have put the link between angle brackets. OT – looking for help finding historic data. I’m looking for daily low temp measurements for a desert environment such as Death Valley or some rural area in the desert Soutwest US. Most of the data records I’ve found are averages or high temps but I’m looking for the nightime lows, daily if possible. 1) “hide the decline” is hiding the decline in the proxy, NOT hide the decline in temperature. 2) The conclusion to draw is that the proxy has been used in an invalid way, NOT that earth is on a cooling trend since 1960. 3) Briffa’s data probably does have some temperature data in it, just with more noise and less confidence. Errors in the instrumental temperature series are surfacing from other lines of inquiry, not the trick e-mail. The battle between modernism and post modernism will continue until people born before 1970 are extinct, unless we happen upon a cultural revolution. Funny isn’t it? Because the average gardener would say they need lots of water, sunshine and um CO2? Ok, I just did a quick look following up on my own advice. I compared the Nasa GISS instrument record to the the McIntyre plot above. 3 very interesting observations. 2) MORE INTERESTING OBSERVATION : In comparing the Briffa tree temps to the GISS temps prior to the 1960 (prior to “the trick”), there is a substantial difference in slope. In quickly doing a linear least squares fit, it looks like the GISS is about 0.2 deg C/100 yrs steeper. IS THIS A GISS TRICK ???? 3) On face value, the “hidden” tree ring decline that was “removed” is far greater than the GISS decline from 1960 into the 70’s. At the very least, there looks like there is a serious mis-calibration issue between the two data sets that needs to be resolved before any thing can be said about present day temps compared to the far past temps – and since the AGW argument largely hangs on the notion that we are seeing temps completely out of the realm of the norm, this is issue has to be resolved. I have to go to work – but if anyone wants to run with these ideas – please do. I might do some more work on this over the weekend & try to quantify further. As I rember it Wang had been coauthor of a paper with Jones. The alleged fraud concerned evidence over the unimportance of UHI and related to the existence/non-existence of station histories in China. What a great BBC debate! Very intelligent anti-AGW consensus comments from the hosts and one of the guests. It’s marvellous to see that the AGW propagandists are not going unchallenged, and the interview “gang-up” going the other way for a change. Exactly. “Trick” is irrelevant. What if Jones had actually written, “I tried the clever thing Mike does to hide the decline…”? Read any better than “trick” does? Trick, clever idea, really cool methods, statistical fraudulance… What really matters is he was admittedly trying to hide the decline in the tree ring data that didnt correspond to temp readings and their accepted theory of what ‘should’ be happening. So we’re expected to believe that tree ring data that can’t properly resolve known temperatures accurately and temperature stations two thirds of which have error of 2C or more can resolve a definitive increase in temperature due to the activity of man to a certainty of tenths of a degree C.
I do wish these ivory hacks would speak to a logger in torn pants with a hardhat on. Tree rings depict degree of growth stress. They do not depict temperature. The “trick” is to study the area around and in the stand to determine all the possible factors leading to degree of growth stress (air and ground temperature being only one of many). That includes the species under study. There is a lower and upper limit unique to each species regarding yearly growth and each species responds to stress in different ways. Those who plant trees for a living in hopes of harvesting a second crop within their career lifetime, or their business’ lifetime, know these parameters to a far greater degree than ivory hacks (and I used o be a ivory hack). If they get it wrong, they don’t bring home a paycheck. Say. That’s not a bad idea. I’ve been using the Jedi mind trick metaphor since the climategate scandal broke! Good call! The meaning of ‘trick’ depends on the context, as Jones et al correctly assert. It’s either a way of solving a problem, or a way of deceiving. In the emails above, it’s used both ways. However, the context of the ‘hide the decline’ email shows that it’s used to deceive. The only problem being solved there is how to hide the fact that the proxies aren’t on board with the agenda. I don’t think anyone should take issue with the word “trick.” Trick certainly can mean technique. We should be focused on what the trick or technique was used to do. “Robert Watt, the head of communications for the Stockholm EnvironmentInstitute and a former policy adviser in the British government, said environmental leaders should “relish the opportunity to explain the science” behind global warming. Still, he acknowledged that all the climategate talk has created a “tricky” problem of public perception. “People do come up and say, ‘I see so many different things in the media,’” Watt said. He blamed the press for creating a “fake equivalence” between climate change believers and climate change skeptics. “It’s not that sort of debateabout opinion but, rather, a debate about facts, about observations and science,” he said. Actually Alan, my dad, (who died in ’79), had been saying for some time that the BBC in particular had been left leaning. You know, I’m not sure how great the Team’s defense of their “trick” language is. Saying that people misunderstand when they say “hide the decline” because they were really just referring to a published divergence problem doesn’t change that much. Saying “hide the divergence” or “hide the decline” amounts to about the same thing. Like McIntyre says, lets have some engineering quality analysis. It’s not really that comforting to hear people who are entrusted with a pretty responsible task to defend themselves saying that most everybody talks that way in private. Sure a lot of organizations probably do operate with a lot of loose talk, but I hope that my banker, or my accountant or the people that designed the apartment building I live in don’t talk about hiding things. There is way too much at stake to be hiding anything. 1. Jef, please don’t blame Michael Mann on U Penn (they have enough problems with President Amy Guttman reviving the old moribund Sheldon Hackney PC policies), he’s a Penn Stater. 2. 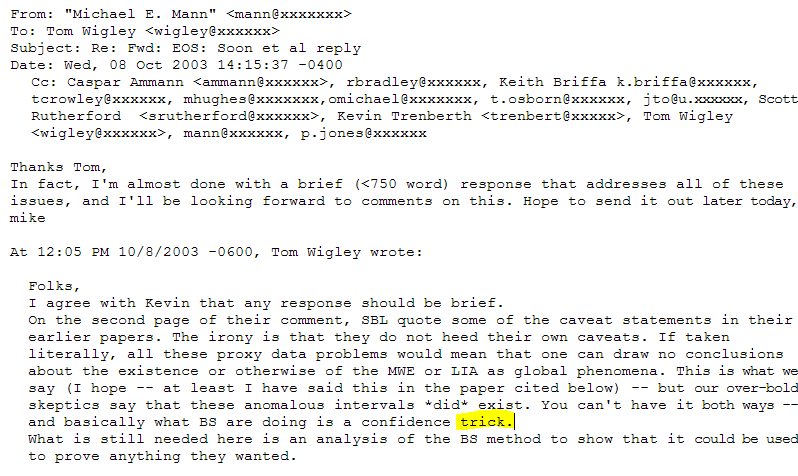 I can accept the CRU explanation of Jones’ use of “trick” (I think some of the readers here are reading too much into some of these e-mails) but it just reinforces my perception that Mann, Jones et al have some combination of self-delusion and global deception going on. They used a neat academic “trick” to throw out data and replace it with numbers that conform more to their world view. My biggest issue is that’s Propaganda not Science. 3. Many of the e-mails I’ve read so far show a lot of the correspondents suffer from group think and therefore it’s no surprise to me this (coupled with their self-delusions and religious-style zealotry) resulted in manipulation of the data. Briffa and Jones saw they could manipulate their growth ring numbers to conform to their preconceived notions (including those about MWE and LIA) regardless of the discrepancies so they have convinced themselves that the tree data IS the truth data and everything else is garbage. I sorely wish they really would practice science. Given the amount of grant money obtained by adding the words ‘global warming’ to every possible study, maybe Mann should be transferred. May I suggest Penn State to Sate Pen. He should at least be awarded the title ‘un indicted co-conspirator’. They say the quote has to do with replacing tree ring data with actual temperature measurements once the tree ring data stopped correlating with actual temperature measurements. So if it stopped correlating ~1960 and we have no idea why, then how do we know we can use tree ring data to reconstruct temps way back into the past? WHY ARE WE USING TREE RING DATA AT ALL? As dry air cools by 1deg C per 100 metres altitude and we have seen a warming of 0.6 deg C over the last 100 years why would glaciers retreat by more than 60 metres altitude in the last 100 years? What’s the trick? If the direst of AGW predictions come true and the temperature rises by 6 deg C why would glaciers retreat more than 600 metres in altitude? What’s the trick? If the melting of glaciers in the Himalyas is a concern for the future of the water supply and if the glaciers were to start to grow because of cutting CO2 wouldn’t this lengthening cause a water supply concern as well? What’s the trick? Yes, you’ve hit the nail on the head; the facts no longer matter to the political class. That is the hallmark of tyranny in any age. Truth is discovered. Truth leads to success and prosperity. Prosperity leads to abandonment of care and principle which leads to contempt and debauchery which leads to suffering and resentment (tyranny) which leads to struggle and commitment which leads us back to . . . (drum roll) Truth. (Imagine a sine wave here). Thanks Pamela. It is interesting that the other poster who commented on your post simply resorted to ridicule and name calling. Perhaps he is the one titillated by a logger in torn pants. I have two trees I planted in my yard 30 (thirty) years ago. They are close enough together that I believe it can be assumed they have the same temperatures and soil conditions. They differ only in the amount of sunlight they receive. One is beneath a canopy of older trees so that it recieves only diffuse light. One receives at least 6 (six) hours daily of direct sunlight. They are holly trees and may not have rings but they are still trees. The one receiving direct sunlight is approximately 20 (twenty) feet tall and the one receiving diffuse sunlight is 4 (four) feet tall. As a tree farmer and expert with a chainsaw it is easy to observe the different rate of growth of various species of pine trees (tons of rings there). It is common practice where my timberland is located for everyone to thin a stand of pine timber 15 years or so after it has been planted either with seeds or seedlings. The reason for thinning the trees is to admit more sunlilght and visibly increase growth rate. Sorry, I do not have torn pants. I do not wear a hard hat or reinforced pants. Have not yet had the saw rebound to the top of my head or become entangled in my pants. Do a search on “pine growth rate studies” mates. Both quality climate science phrases I’m sure. I just searched Pubmed and the phrase “hide the …” did not appear once in the entire literature. “Trick” was used thousands of times. A very interestimng exercise. Perhaps it could be followed up by looking for words such as “hide”, “conceal” and “bury”. Ok, in the email I was looking at above talking about rejection rates, what is the hypothesis they are testing? Does anyone know? Don’t consume any and we’ll have it forever. You first, Mr. Willem. Son of Muldar: the source of water from the Himalayas is snow, not glaciers. And, if the world temp rose, would not the amount of water vapour in the atmosphere rise as well, which would lead to even more preceipitation (ie snow) as it cooled in the upper atmosphere. Maybe I’m wrong on that but it seems logical to me. So many top executives of A.I.G. , Goldman Sachs , CitiCorp and others receiving bonuses for their participation in the ‘ planned ‘ financial collaspe of world economies. You can call them bonuses , executive compensation , retention bonuses , payouts or grants , I call it Hush Money . 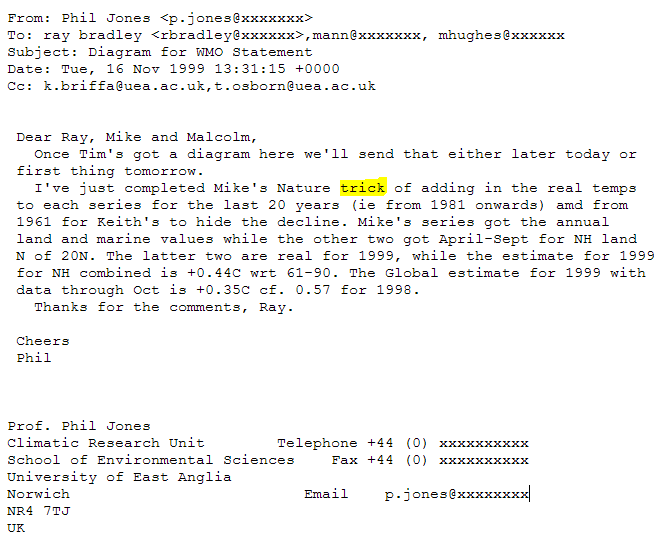 Since 1990 , it was revealed in the ‘ leaked ‘ emails from the University of East Anglia’s Hadley Climate Research Unit that Phil Jones had collected a staggering 13.7 million British pounds ($22.6 million) in grants and in return , the world had gotten in return ‘ tricked ‘ data from the CRU , IPCC and the UNEP . When it was stated that the term ‘ trick ‘ is a clever way of doing something – a short cut can be a trick in science , the term ” Trick ” also refers to a Prostitute taking Money for a Lewd Act ! 1.At those altitudes temperatures are below the freezing point of water. 3.To have ice you need first WATER. 4.To have water you need evaporation from the seas. 5.To have evaporation from the seas you need temperature increase. 7.So for glaciers to retreat you need COOL oceans and NOT WARM oceans. Thanks Bob, so now you know Al Gore’s future. The “next turn of the screw ” wisely described in your post. Of the 23 words used to describe TRICK, only “technique” has a positive spin. I would have to guess that the “tricky” part for all those participants in the Global Warming Conference who left their wives back home will be to convince their wives that they themselves weren’t one of the “tricks” that the legal Danish prostitutes turned. That will be “tricky” indeed. They obviously didn’t bother to read this post. No, it doesn’t. But one thing I haven’t heard anyone mention is that he says “adding in the real temps to EACH series.” That certainly looks like he is adding the instrumental temps to each series of tree rings or sediments or whatever other proxies are used. Is that the way others read this? If so, it would really bias the final result. Sublimation does not require reduced atmospheric pressure. Just put an ice cube you have measured in a saucer in your refrigerator’s freezer compartment. After a month, measure the ice cube again. Wind does help the sublimation process quite nicely, however. The greater the velocity of the wind, the faster water ice sublimates. I couldn’t agree more with this post. A trick is something a person does to mislead them. And that’s exactly what Jones and the rest of the CRU/GISS/IPCC consensus cabal did to the public of the world. Fudged the thermometer data set. Used statistical methods to hide information contrary to their belief. Conspired to prevent legal FOIA requests from being implemented. Worked as a team to pervert the peer review process, so that pro-CAGW papers were published while sceptical papers were not. Colluded with the press to spread alarm, in furtherance of their political agenda. These people have no right to call themselves scientists, and have done untold harm by there blatant miss-information. “and at least one scientist speculated that the timing was not coincidental. given revkin’s own involvement in the emails, it’s breathtaking how the paper that sets the agenda for the US corporate media, gets to set up the “talking points” for all subsequent media…or should i say media silence! I’m so sorry that my sense of humour does not find favour with you, but I guess we’re all different. I don’t mind in the least you taking the mickey out of me but I do object to it being said that I am guilty of name-calling. What name have I called Pamela Gray, or indeed, anyone else, please? 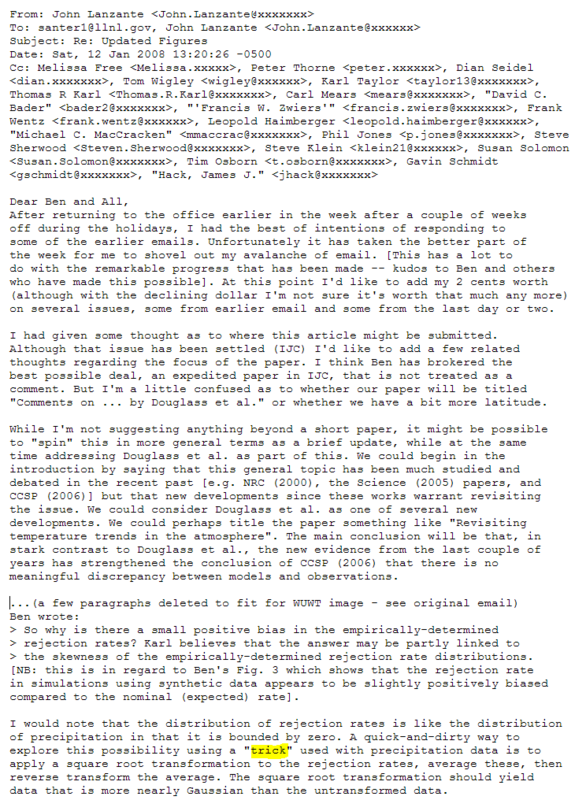 Over 30 years ago I received an email from somebody on the Internet (way before Gore “took the initiative in creating” it) about a Unix program that could be used to list all the words of a text document in alphabetical order, in bold font, down the centre of the pages of a new text document. On each side of the word (in bold) were the preceding and following words to show the local context. I had used this program often but now cannot recall its name, and my backup tapes are long gone. One day I shall take the time to look through more recent (1982ish) Atari floppy backups, just in case something useful is there. Such a program would be ideal to look at the CRU dog-regurgitation. If someone can recall the program name or knows of a recent incarnation, please let us know. Gold-diggers do use various means on mother-lodes. No doubt there will be more revealing instances of fraud before this climate-alarmist “bandwagon” plays its last tune. For those who require direct, printed evidence of such “bandwagons” please do look up the indirect evidence (concerning herd-instinct, etc.) as listed on countless Internet sites. As a retired scientist of 42 years I have been VERY well acquainted with various “bandwagon” ideas over those years. Obtaining direct written evidence, now or then, would be next to impossible; archiving direct deceit is not the way “herds” work. Only, after the fact can we look back, and apply some “statistical” or other indirect searching methods. This may come as a surprise – or not. Always? Got a cite for that? “Here, the expected 1990 – 2003 period is missing – so the correlations aren’t so hot! Yet, the WMO codes and station names/dates are identical (or close). OK, let’s stipulate to that. Let’s reword/rephrase that entire sentence, substituting words and phrases, including your definition, and even try to make it mean what he claims it meant (while elucidating). I’ll go first, and let’s see how it sounds, shall we? Your turn! If you don’t like my rephrasing, offer one of your own — with one proviso: that you don’t leave out direct substitutions for the words “trick”, ‘hide” and “decline”. But retreating glaciers are meant to be evidence of anthropic global warming. So is that a trick or a lie. Because if as you both suggest global cooling causes the retreat of glaciers then we must be cooling . I always understoodl that glaciers moved downhill because of the increasing weight of ice above from extra snow pushing them down. And the snow came from evaporation of water from the land and sea, which as you say would increase with warming. Here’s another. I was told that the tropical tropospheric hot spot predicted by AGW theory models could not be found because temperature measurements by radiosonde and satellites could not be trusted. Instead I was told I should rely on the calculation of temperature from measuring windspeeds at those altitudes. Is that a trick? Exactly what was “Mike’s Nature trick” ? This should help reveal whether the trickery is real. Exactly what was “Mike’s Nature trick” ? That is, what did Mann do in what Nature paper that is similar to this “trick” ? That point aside, I think it’s a bit of a non sequitur to say that this set of emails should conclusively demonstrate the colloquial use of the word “trick” or it is a lie. The problem isn’t that he is lying about the use of the word; the problem is that he thinks you should be able to use arbitrary “tricks” when preparing data. Good Question. It may have something to do with him being a “Texas Sharp Shooter”. 1) After climategate was coined (sorry bout that 🙂 it was auto-suggested on Google. 2) Hits rose to thousands on Google within days, but after a week or two they sky-rocketed into the millions and then 10s of millions. 3) Google autosuggest for climategate disappeared after a week or so. 4) Last week climategate hit 32 million plus on Google and over 50 million hits on Bing. 5) today Google reports only 25.8 million hits… clearly peaked and declining as far as Google is concerned. Strangely Bing is still reporting 50 million plus. What is wrong with these search engines? Is the trend in Google hits (I wish they were traceable like the google trrend meta data) being tampered with? or does it reflect daily blogs disappearing or the like? OK, with reference to [noel (13:12:51)] I’ve found a neat little program for Windows called “KWIC Concordance” for Windows. Likely, there is a better Unix version somewhere out there. It will do about what I had remembered. Not as nice as in Unix but it can deliver all the words of a text document in alphabetical order in their immediate context, a line for each word. I tried it on some relative small files, and figure it likely will work for a much larger concatenated text file of the CRU emails. We called that a “permuted index” at CMU. I vaguely remember the Unix program you describe, I think it was used in part of the documentation. I have no idea where it might be now. I’m thinking of writing one for my WUWT Tables of Contents pages (see http://home.comcast.net/~ewerme/wuwt/ ), but it won’t be for a little while. Just the emails shown above are pretty damning, to say nothing of the others I have read. Taken as a sample, they show that quite a bit of energy is going into the whole business of supporting their hypothesis and fending off criticism rather than into TESTING their hypothesis. I’m a psychologist. It is well known that if you want to increase the probability that a behavior will reoccur, you reinforce the behavior. These guys have been reinforced (through their funding) to produce results that confirm the AGW theory. It is also well known that if people behave in ways that are contrary to (or dissonant with) their basic beliefs, they will “rationalize” their behavior, even to the extent that it becomes ingrained in their value system or belief set. True objectivity is thrown out the window. It is entirely possible that Michael Mann, Jones, et. al., may be no more aware of how they are influenced by their reinforcement than gamblers or fishermen are aware of how THEY are influenced. The scientists have been manipulated. While this does not excuse their behavior, it seems to me that we should be taking a hard look at government and private funding, what people have been approving this funding and what their agenda is. Considering the amount of money that has gone into funding climate science that supports AGW, there clearly needs to be some major reform in the near future. Thx, guys. Well, I tried the KWIC program in Windows but after 36 Gbytes of concordancing things sort of bogged down. I’ll look at it in Unix. It really is a pretty common colloquialism. Hansen was on Letterman the other night. While he said a lot of things WUWT regulars would find eye-roll worthy, he also called on CRU to release their data. . .
As I’ve mentioned on ClimateAudit, it looks like Briffa’s data was reprocessed until it looked most sharply like an upside-down “hockey stick”, and then the descending blade part was removed. This method ensures the greatest (visible) rise at the end. You can do this with any data, process it so that the peaks and valleys are maximized (although the midline remains the same), and then cut off the last big slope. The remaining data has a false final trend and a false midline. Looks like they did this. Oh, how very principled of him. And HOW DARE HANSEN, given that he now appears to be the one HIDING DATA, MAKING IT NO LONGER AVAILABLE. Just watched the Hansen clip on Youtube. The man ought to run for politics… how he can say some of the things he does with a straight face amazes me. That takes some talent. He has well and truly stepped out of the field of science into full-blown advocacy. Keith Briffa creates a climate proxy from northern treerings for the last few thousand years. This seems to be a good proxy for temperatures so Mike Mann uses it for some of the proofs for his theory on AGW. But the last 60years the proxy is down because conditions are less favorable to the trees, so he uses a “trick” of including thermometer records to hide the decline in his paper in the “Nature” publication. Phil Jones brags in a Email about useing the same trick in his own papers. Now they have been supervising the correction of of the temperature records that are incorrectly not following the proven science. This only has to work untill Copenhagen is won. Now “climategate”, and Copenhagen may be a bust, the hole of lies is getting deeper and wider, I wonder if they will ever stop digging? My, don’t we live in interesting times? I think “hide” is the context for “trick” here. Having sawn in my youth various trees and having my suspicions raised by C14 dating calibrated by tree rings and vice versa, I tried to point out the tree ring problems in AGW fraud long time ago. I forgot about you, Mr.Watt, sorry. As Ms Gray implied, the problem with scientists is that for the forests on their computer screens they can’t see a real tree. Otherwise, I find the debate about a word or two in those e-mails, as if you were a bunch of lawyers, amusing. Lawyers get paid, at least. CRU fraud is blindingly obvious, no need to analyse the sick excuses of those rapacious minds. We must act nomatter good science or not.